Here’s the thing. I wasn’t planning on going to Deeper Still in Atlanta this weekend. In fact, Mom had asked us repeatedly to go, but for some crazy reason, none of the sisters wanted to go. Fast forward to the SheSpeaks Conference, where my friends Sophie and Melanie are talking Deeper Still up like a storm. So I beg Mama to have mercy and get us tickets… though a little late. As usual, she succeeded. Duh. Which I swear I wasn’t stalking them- they know I took that picture…. well, Sophie and Melanie do. I didn’t check with Beth or Travis, but I’ll call their cell phones later to check. I’m gonna let you figure out whether I mean that or not. We were there Friday night and most of the day Saturday. Each session began with a video clip about each of their lives, then worship, then teaching for each women individually. The afternoon had all three women sitting together on stage in a panel like Q&A. The worship was amazing- the voices. Oh. My. Gracious. It was like an orchestra of beauty. I could have listened for a long LONG time. And the teaching was unlike any I’ve gotten to sit under in a while. Deep. Challenging. Smart. Encouraging. Did I say CHALLENGING?!? 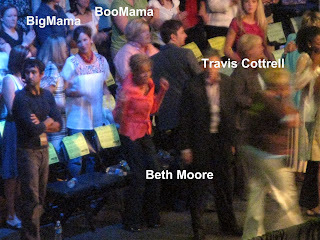 All three of these women, Beth Moore, Kay Arthur, and Priscilla Shirer, brought fresh words that were very timely and very scriptural. And maybe a bit CHALLENGING. These women. They love the Bible. I leave their sessions and, among other things, think this- I want to love the Bible like that. And I think they would consider that a success. There are tons of great pictures and some live blogging up on the DEEPER STILL BLOG, so you can check that out too. 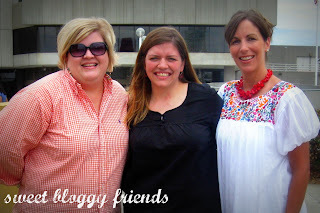 Another joy to my weekend was spending time with these girls. It has somehow happened that a mere weekend together, a handful of texts, and far too many emails, has made us real friends. And I’m grateful. They are both wise women in the Lord and a few steps ahead of me in life- it is NEVER a bad choice to add to your arsenal of mentors, I say. My Mama, Mom’s friend Melissa, and my friend Kathleen, Sophie, Melanie, and myself ate lunch together outside. And Kathleen made these shut-up-how-in-the-world delicious brownies. Because she loves all things bloggish, though she refuses to blog herself, we have named these desserts Blogger Brownies. Please. If you love me at all, you will make these for yourself. If I could make them and send them, I would. But it is never wise for me to bake this amount of awesome when I’m alone in the house…. there will be nothing left to ship out. [At least I know my limits.] Enjoy! Preheat oven to 350. Grease a 9×13″ pan. 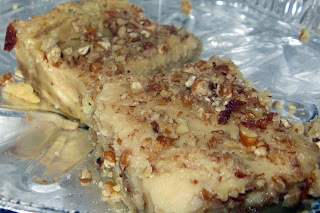 Combine cake mix, melted butter and 3/4 cups nuts. Press into bottom of dish. Combine brown sugar and cream cheese until well mixed. Spread evenly over cake mix crust; sprinkle with remaining nuts. Bake 25-30 minutes. Cool. Cut into squares. Store in refrigerator.